Perfect storage solution for personal and/or business documents. Strong and sturdy construction. Made to last.. Oversize with easy-to-read contents and description panels. Suitable for Foolscap (FC) suspension files. External Size (H x W x D) - tba - Max Load 25kg - White/Blue. Space saving storage for all documents and magazines. Australia's most popular archive box - the economical choice for long term storage where frequent access is not required - Stacks up to 4 units high. Double end walls and double layer base ensures contents will not burst through the base when carried. External Size (H x W x D) - 265 x 320 x 260 x 400 mm - Max Load 25kg - Brown. Extra strength archive box for everyday medium-duty use. Stacks 4-7 units high. Features double bottom, double end, single side construction. Australian made from 100% recycled content. Recycled content is 70% post-consumer waste. 100% Recyclable. Internal Size (H x W x D) - 250 x 305 x 385 mm - Max Load 25kg- White/Blue. Quick FOLD® Archive Box for ultra fast and easy assembly in seconds... no more frustration. Just squeeze ends and box self-assembles - Stacks up to 7 units high. Reinforced double base and double end walls ensure greater strength and longer life. Spacious labelling area for identification. Snug fitting lid keeps out dust, dirt and moisture. External Size (H x W x D) - 255 x 305 x 390 mm - Max Load 25kg - White/Black. Price each - Order 20 to receive a carton. 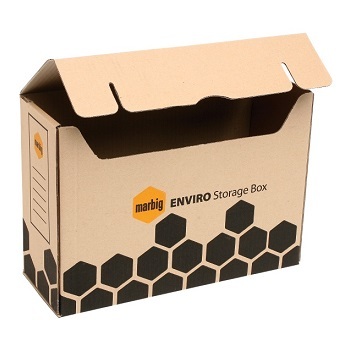 Our most popular maximum strength archive box designed for regular heavy-duty use. Stacks 6-10 units high. Features double bottom, triple end, double side construction. Internal Size (H x W x D) - 255 x 325 x 375 mm - Max Load 35kg - White/Blue. Price each - Order 12 to receive a carton. Commercial grade heavy duty archive box designed to hold 20kg without bursting through the bottom. Stacks up to 10 units high without collapsing. Complete with triple-end, double-wall and double-base construction. External Size (H x W x D) - 260 x 305 x 400 mm - Max Load 35kg - White/Black. Double length archive box to fit the contents from an entire filing cabinet drawer - Stacks up to 7 units high. Complete with double-end, double-wall and double-base construction. External Size (H x W x D) - 260 x 390 x 620 mm - Max Load 25kg - White/Black. 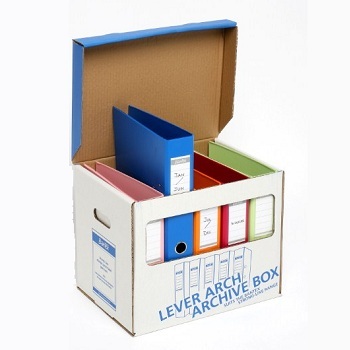 The only archive box designed to hold 6 lever arch files. 50% larger for archiving ring binders and lever arch files. Triple end walls and double layer base provide superior stacking strength – up to 10 high. Holds foolscap suspension files/manilla folders, or up to 6 A4 lever arch files, or 12 ring binders. External Size (H x W x D) - 340 x 480 x 325 mm - Max Load 35kg - White/Black. Price each - Order 5 to receive a carton. Designed for Lever Arch Files, particularly Bantex Strong-Line Files. See through window allows fast archival identification. Holds 5 Lever Arch Files. Double end walls and double layer base. Attached lids means no missing lids. Material is 100% recyclable flute board. Note: Available to Sydney Metro customers only. The archive box with added convenience of a hinged lid for easier packing, and also ensures the lid doesn't become lost. Stacks up to 7 high - Max Load 25kg - Woodgrain.